Do you like to wear something different and individual but are on a tight budget? Sometimes you can dress up what you already have with something from your wardrobe, jewelley box or even the kitchen if you think a little outside the square. Other times you may just need to swap something with a friend or make a small outlay, perhaps an op shop buy. 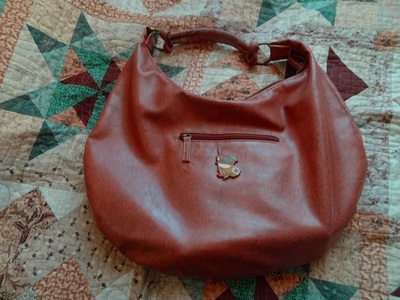 Use a brooch to decorate a plain bag. You can just pin it on or you may be able to remove the pin from the back and super glue the brooch to your bag for a permanent fixture. Attach a charm to the zip puller of a bag or purse. Use a serviette ring as a scarf ring. Perhaps you have a ring you find too bulky to wear on your fingers. Before you give it away, consider using it as a scarf ring. Swap chains around on your jewellery. Sometimes a longer or shorter chain or one that is thicker or thinner means you get more use from a piece of jewellery. If you don't have what you need already, perhaps a friend has surplus items. You may be able to swap. Alternatively, buy one from a budget store, op shop or garage sale. Use some stretch fabric to plait a 'chain' for a bulky pendant. Often you can dress up your wardrobe by repurposing something, swapping things around or by trying different combinations.